Gotta say that I have strayed from Banana for some time as I am pretty much devoted to the Crew (or should I say was until quality became an issue over the past year) but this jacket is awesome and looks fab on you. You’ve made me take another look at Banana. 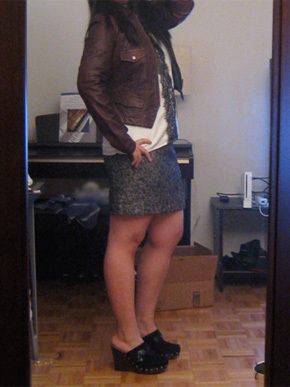 On the website it looks as though this jacket has a peplum in the back (gathered at the waist) is this the case? Hate to be rude but what are your general measurements for fit on this jacket. PS-love your blog and have been following it for quite some time. Hey Michelle! I feel the exact same way about BR – I barely looked at it for over a year as all their stuff looked so boring, but now I wouldn’t say I’m fully back, but I’m definitely looking again. As for the jacket, there is something there in the back (not sure if it’s a peplum) that makes it look nipped in at the waist. It is not straight up-and-down. For fit, I’m honestly not sure what my actual measurements are, but if it helps I’m usually a Small in J.Crew knits, around a 6 in shirts and jackets/outerwear. 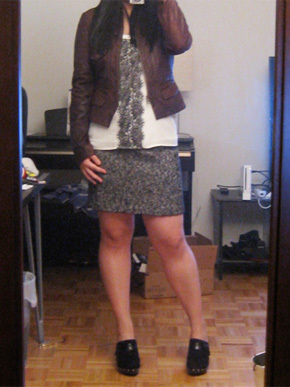 The Small is do-able in this leather jacket, but Medium definitely felt perfect. Hope that helps! I have been liking BR a lot lately. They have a lot of new nice things, and a lot of promos! Who can beat 40% off? It pays to sign up for offers by e-mail! Rose – I know, it seems like they have promos every other day. It’s pretty awesome but has completely spoiled me – no way I’ll buy BR without a promo now!